Learning Analytics was a hot topic and generated some big questions, such as: how do we measure student engagement over time? Can we do A/B comparisons of the same course to isolate variables? How can we frame big picture questions about authentic student engagement (vs. clicks)? New Users discussed how to leverage the transition for making connections with faculty. A new LMS is a great opportunity for instructional designers to do outreach to those faculty who were transitioning - leveraging this transition to create opportunities for faculty engagement - and introduce different kinds of learning activities. Speaking of Outreach and Partnerships, this group discussed how to best utilize Canvas with non-course entities, such as Academic Advising, Student Life, and Professional Development for students, faculty and staff. We all have different needs, of course, and the LTI and External Apps group had a LOT of show and tell. The big picture questions around this topic included the creation and testing of these apps. However, not everyone needs an external tool to make Canvas work for them. In the Templates breakout session, there was much discussion about making sites that reflect best practice for student need while also allowing freedom for a faculty member's own style. Speaking of faculty needs, the Working with Faculty group had a great conversation about leveraging Canvas to best assist faculty with their Instructional Design needs. 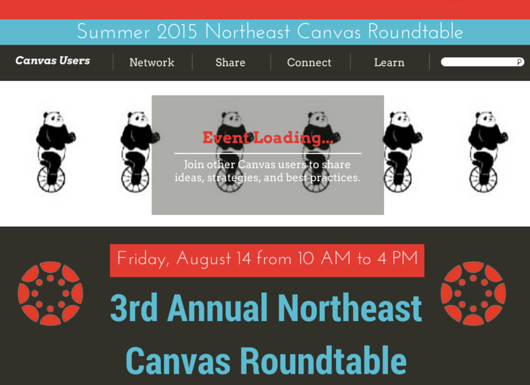 We look forward to planning the 4th iteration of the Canvas Roundtable, in collaboration with our colleagues across the Northeast!